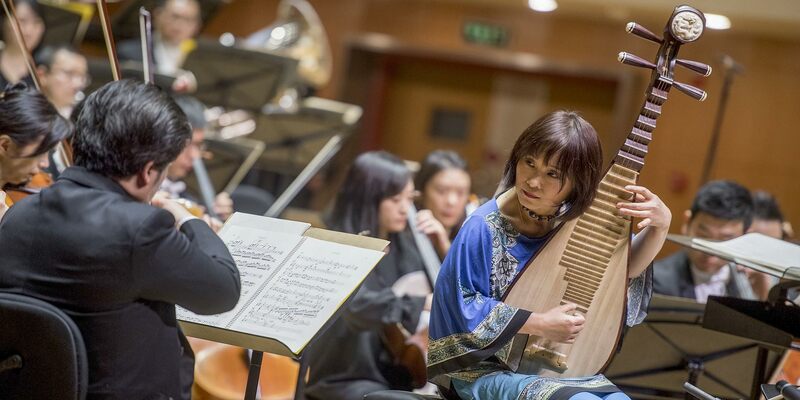 Master musician Wu Man has been touring the country with a group of collaborators from cultures connected to the ancient trade route. Henry Ace Knight is a freelance writer based in Shanghai and the interviews editor of Asymptote Journal. Last month, Grammy Award-winner Wu embarked on a tour of China spanning 12 cities in 22 days. This latest offshoot of her “Borderlands” project, which aims to bridge Chinese and Central Asian folk music traditions, also features Juraev, Uyghur singer-songwriter Sanubar Tursun, and Italian percussionist Andrea Piccioni. On May 14, the tour crossed paths in Beijing with the Belt and Road Summit, an international forum on China’s ambitious new infrastructural project to promote trade along and beyond the arteries of the ancient Silk Road. With Chinese construction of tunnels, bridges, and railways underway across Europe and Asia, this was an opportune, if only coincidental, moment for Wu to realize her long-held vision of introducing Chinese audiences to Central Asian folk traditions. Well before the Xi administration appropriated the metaphor of the Silk Road for global economic exchange, Chinese-American cellist Yo-Yo Ma adopted it for cross-cultural musical collaboration. It was through his Silk Road Project that Wu first met and played with musicians from Central Asia, including Juraev, with whom she developed an instant musical chemistry. For more than a decade now, Wu — hailed as a leading ambassador of Chinese traditional music abroad — has dreamed of returning to China as an envoy of the world music textures that have become an integral part of her genre-bending sound. While traditional instruments have found their way into experimental modern soundscapes, their popularity among younger urban audiences is dwindling. When Wu was approached about the possibility of a 10-city solo tour of China, she had something else in mind. “I said no, I don’t want to do solo concerts. I want to do something that represents what I’ve been doing, the value of my experience. I want to share that with the younger generation.” What followed was last month’s Borderlands tour, possibly the first-ever series of world music performances to acquaint predominantly Han audiences with the sonic cultures of the Silk Road. Wu curated every element of the tour — the route, the format, the set list, and the arrangements — for Chinese concertgoers with minimal prior exposure to such curiosities as the two-stringed Central Asian dutar, its close relative, the tanbur, and the Italian drum known as the tamburello. Rather than stopping in China’s more cosmopolitan megacities, Wu opted to target mostly second- and third-tier urban areas. 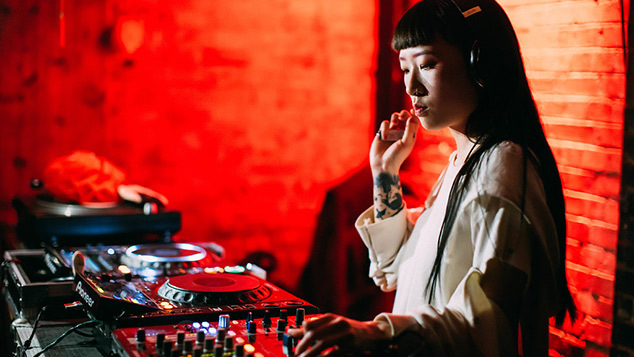 While traditional instruments have found niches in more experimental contemporary soundscapes — like Beijing’s Sinofuturism scene and Dali Old Town’s alt-enclave — their popularity among mainstream audiences, especially younger urban ones, is dwindling. 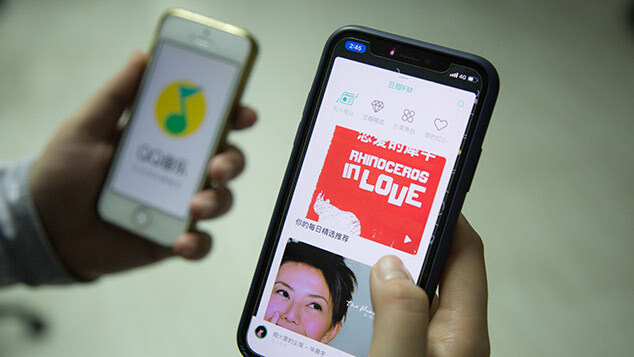 Wu hoped to connect with young people in these cities by performing in Poly Theatres, performance spaces across China that often tailor programming to families. Breaking with classical Chinese performance conventions, Wu engaged the audience in dialogue about the instruments represented onstage. The conversational format paralleled her early shows in the United States, when the pipa was still a little-known instrument. After solos showcasing the dutar, the tanbur, and the drums, Wu would introduce the instruments to the audience, translate fragments of their respective histories relayed by her fellow performers, and prompt the crowd for live feedback. Though well-received, the tour wasn’t frictionless. On too many nights the ensemble played to half-empty rooms. It was daunting to curate an hour and a half of music that would stand in for the sonic culture of a region as sweeping and diverse as the Silk Road. Wu’s approach was simple: defer to the strengths of master musicians Juraev, Tursun, and Piccioni, and stretch the pipa beyond its classical context while retaining its traditional flavor. The first set, with Juraev on dutar and Piccioni on percussion, featured Tajik and Kazakh folk songs in solo and group arrangements, as well as several pipa tunes. A haunting rendition of “Night Thoughts,” an original composition drawing on ancient Buddhist music from the Dunhuang Caves region, was bookended by a bouncy group take on a Kazakh tune and a stirring drum solo by Piccioni. Later, Tursun, a native of the Ili Kazakh Autonomous Prefecture in China’s far northwest, joined on dutar and vocals. Juraev took up the tanbur, a long-necked stringed instrument plucked with an iron fingerpick that enjoys a near-ubiquitous musical presence across Eurasia and the Middle East. The centerpiece of the second set was an excerpt of muqam, a hybrid form of religious or romantic narrative that originated in Xinjiang and was later transmitted to Persian cultures along the Silk Road. It would not, Wu forewarned, make for easy listening. Standard muqam performances last an hour or two. Tonight’s, however, would be just 15 minutes. For concertgoers who arrived at the venue anticipating troves of material from the solo pipa repertoire, this was a challenging listen and an unexpected treat. Though well-received, the tour wasn’t frictionless. With the Poly Theatre group’s high staff turnover rates, scant resources, and bare-bones promotion, on too many nights the ensemble played to half-empty rooms. Few venues bothered even to print posters or programs. For the level of musicianship on display at a performance without precedent in China, it was a shame to leave any seat unfilled, let alone entire sections of newly built concert halls with fine acoustics. Theater management was at best unprofessional, and at worst inflexible to the point of absurdity. In Qingdao, in eastern China’s Shandong province, for example, an attendant asked Wu to move from the first row of seats during the sound check because their contract stipulated that the performers could only sit in their dressing rooms. When the ensemble took the stage at the beginning of the show, concert staff hadn’t shut the theater doors or asked the audience to silence their phones, a problem that recurred throughout the tour. Another obstacle was the availability of recorded music. “Borderlands,” Wu’s 2012 record of collaborations with Central Asian musicians, was never released in China, so concertgoers enamored with the performance had little opportunity to delve deeper. Despite such encumbrances, audiences were so receptive to the music that a follow-up tour with the same outfit is already in the works for next year. “I would like to listen to that [music] a million times,” Wang Yeqi, a 26-year-old from Shandong, told me after the show in Qingdao. 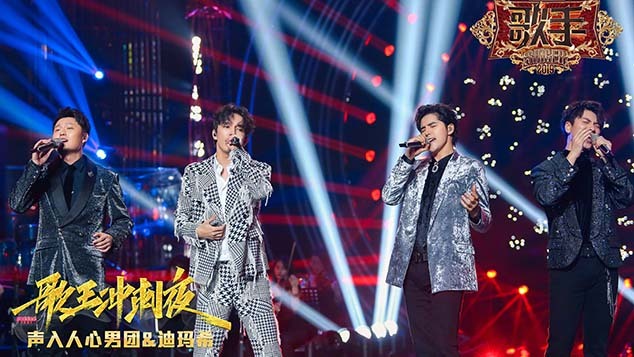 “The instruments all have their own character, but together they harmonize so well.” This month’s tour laid the foundation for an ongoing effort to familiarize Chinese listeners with the music of a region primed to become an important part of China’s future growth.